New Navionics+ marine charts provide the latest cartography in an easy-to-download format. Simply plug in your chip, select the coverage area you need (up to 2 GB), then pop the chip into your plotter, and you're good to go! Please note that this product covers the United States only and is not for international use. 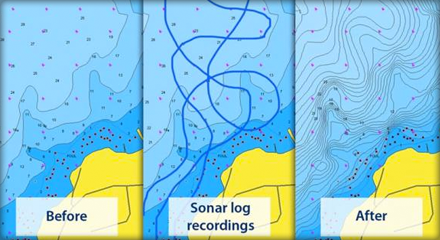 Navionics Freshest Data � When you buy Hotmaps Premium, Hotmaps Platinum, Fish'N Chip, Plus, Gold or Platinum products you are eligible for unlimited updates of the 2D Gold component and SonarCharts (see below) for a period of one year � this means you always have access to the Freshest Data. Simply go to Navionics.com, plug your chart into your computer, and the software will update automatically. 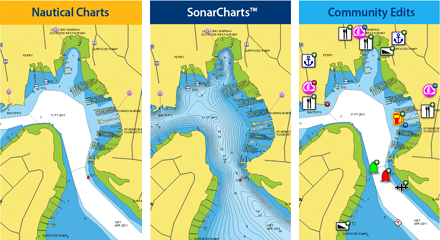 Navionics Plus contains everything on one card: Nautical Charts, SonarCharts and Community Edits. The Navionics+ program essentially replaces the Gold series; you can get all the same great Navionics Gold cartography but in a downloadable and easily-updatable format.